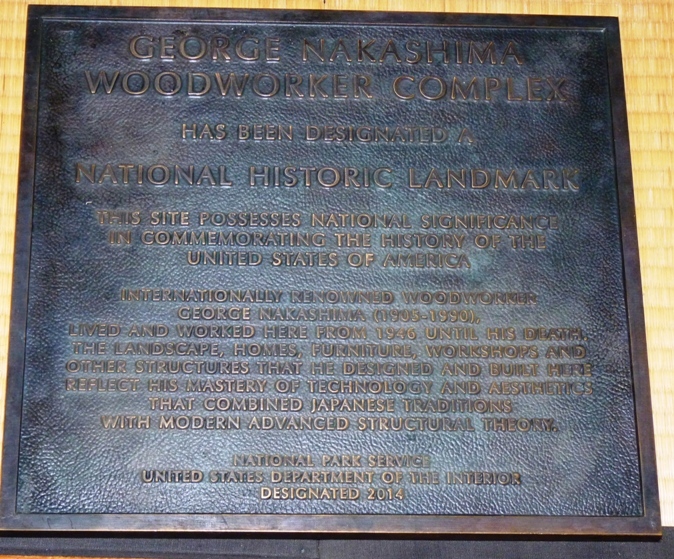 The Nakashima Woodworker property and working studios were listed on the National Register of Historic Places on August 14, 2008. In April 2014 it was also designated a National Historic Landmark. The site was listed on the World Monument Fund‘s 2014 Endangered Sites Watchlist. Combining international styles and modern influences with Japanese craft traditions, his work was a significant force in the American craft movement of the mid-twentieth century. George Nakashima was born in 1905, in Spokane Washington, to Japanese immigrants, and although he was US-born, he and his wife were evacuated and moved to a relocation center for Japanese in the US during WW2. 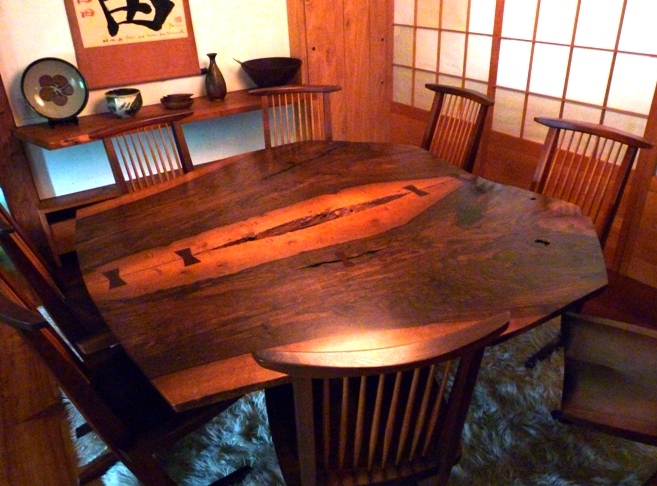 Prior to that, Nakashima studied Art and Architecture in the US and around the world. He brought his knowledge and sensibilities of nature, art, architecture, wood and furniture together into his world renowned woodworking designs, still a working business today. 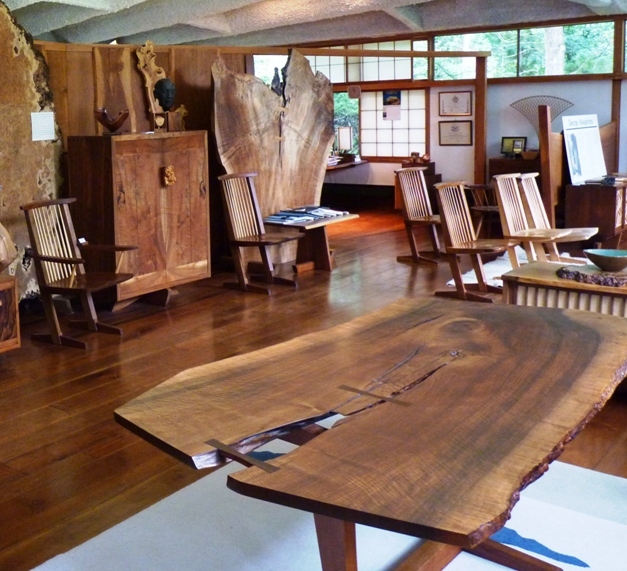 Not only is it a naturally beautiful 12-acre property filled with Nakashima’s furniture and architecture, the visual arts of his friends and contemporaries are on display as well. He was friends with some of the great artists and architects of our times, and you can see some of their work on display in various buildings. This peaceful site conjures up a yearning to meditate or do yoga, which makes sense since he had hoped the property would also serve as an ashram or retreat, although it was never used that way. There are 21 buildings on the property built in the International Style with elements of traditional Japanese architecture by Nakashima. His buildings are south facing and take advantage of heating, cooling and light from nature. He designed and built every building on the property. Nakashima was known for his Hyperbolic Paraboloid shell that forms the sweeping dramatic roof of the Arts building. 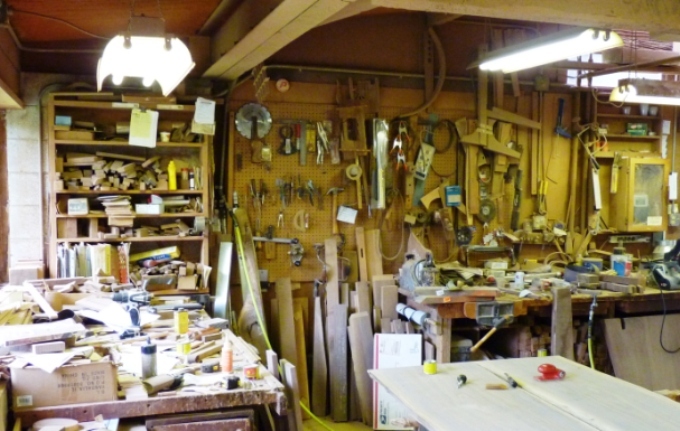 His work and legacy live on as the family, who he trained, continue to run the woodworking business and manufacture his designs and furniture according to his techniques in using the natural shape of wood. 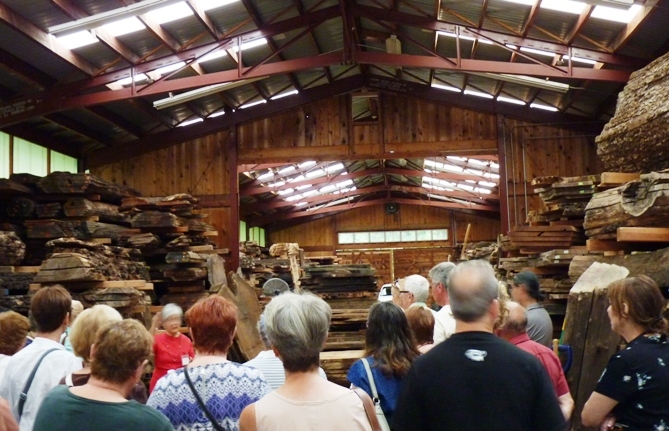 Visit to Nakashima Woodworking compound – George Nakashima House, Studio and Workshop. 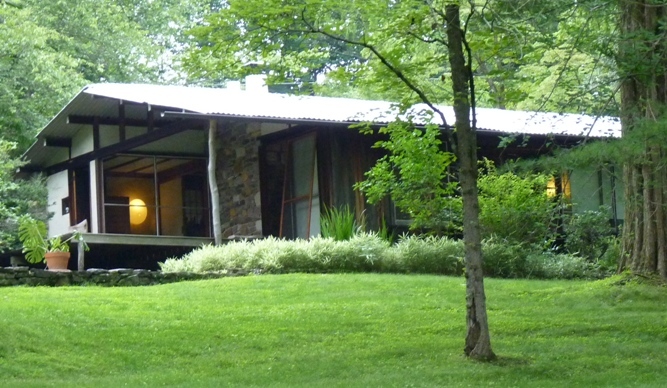 Click link to see images of the Nakashima property. I highly recommend taking a guided tour. Reservations are a must. 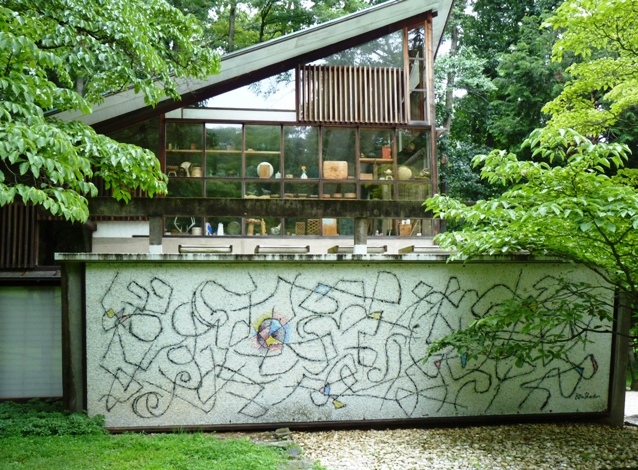 This entry was posted in Bucks County, New Hope, Pennsylvania and tagged Hyperbolic Paraboloid shell by Wendy. Bookmark the permalink. I have only begun to explore Pennsylvania and love what I have seen so far. Have never heard of Bucks County, but will search it out on my next visit. When you come, check out my other posts on the area. There is so much to see here. Oscar Hammerstein, James Michener, many of the the American Impressionists lived here in Bucks County. It always fascinates to think that we’re surrounded by all this history and culture, yet tend to explore further afield. Your experience is proof that visiting places close to home can be just as exciting and interesting. Yes, you are right! I love exploring in my backyard; there is so much history and beauty here. That is why we have chosen to do our 4 months traveling in the US. We have never been to the US Southwest, and I expect it will be every bit as interesting and adventurous as our trips abroad. Looks like a beautiful place both outside and in, and a tranquil place indeed. Great activities too – meditation alongside some woodworking sounds interesting! I had no idea that Bucks county had something so cool. My mom grew up near there and she never mentioned it. I will check it out next time I am near. Long ago I remember seeing his work displayed in the Michener Art Museum in Doylestown. Nice to know there is a dedicated spot now to show his work. Anything that has to do with Japan and Japanese culture has always fascinated me! This has nothing to do with Japanese culture.